East London is historically a poorer area of London, because of the direction of wind blowing dust and air pollution into the area. Inevitably this means that areas like Aldgate and Bethnal Green are populated with the less well off groups of people. This has lead to many migrants living in the east of London throughout the years. I found this an interesting area to examine. I have lived in east London whilst at university and I have always been interested by the south east. So, why was the olympic park for 2012 built in this area. The Queen Elizabeth Olympic Park was built for the 2012 Olympics and was built to create a new thriving business zone in London, making the east of London a more desirable area to live than the West. I picked this for my offline research task because the history of London and how it has developed over the years interests me and the project to build the Olympic park was one that had sustainability in mind from the very beginning. The company that built the Olympic park are called ‘The Development Cooperation’ and they made a guide to how the park will develop and improve the surrounding area and itself for years to come. What I found interesting was that the Olympics bid team promised a sustainable Olympic games. They used the influence of the games to show how sustainability can be used to create a great event and therefore inspire other countries to do the same. They also built the park with the future in mind. They want the area to develop further. ‘We will continue to populate the Park with biodiverse green spaces, clean, usable rivers and canals, and a network of walking and cycle paths.’ London Legacy Development . (2012). Introduction . Sustainability Guide . 1 (1), pg8 . Below are diagrams showing how each flat and building are built sustainably. They all have gardens on the roof to use as insulation and to grow food, they site is full of electrical car recharging points and bike stands to encourage biking around the site. Even the boilers are hooked up to the low carbon distribution heating system to lower heating prices for residents and to lower carbon emissions. The whole park was built with the future in mind. The contractors want to see the area thrive after the olympics and become a business central. This is a sustainable plan as most olympic parks in other countries are left derelict after the event. But London are using the stadiums for local school, events and everyday. The West Ham stadium is one of the old olympic stadiums and the park is filled with football fans every match. I visited the Olympic park today and have decided to zone in on one building for my drawings instead of looking at the whole complex as it is too broad and there is too much information. 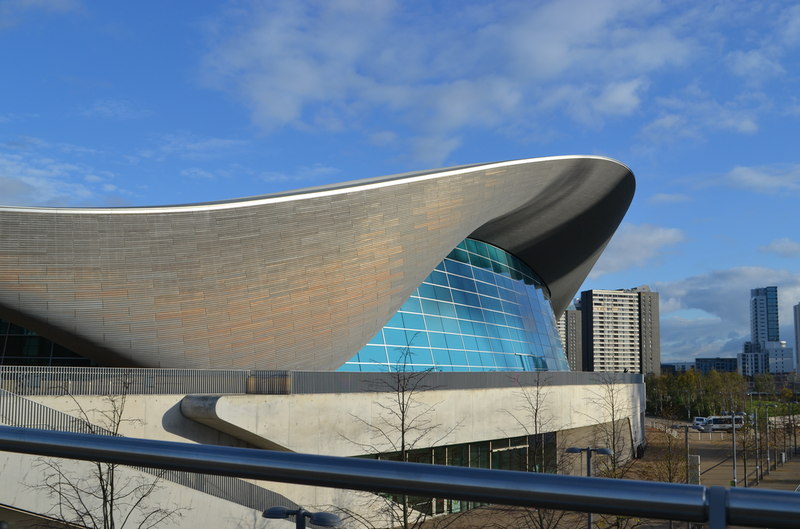 Zaha Hadid designed the London Aquatic Centre in the Olympic park and for me this building really stood out. Zaha was inspired by the fluidity of water in motion creating a sympathy with the river beside. The building sweeps up from the ground and ungulates like a wave. These are quick sketches I did on site of the Zaha Hadid building, for me it really does look at the TED TEN that says ‘Design based on nature’ The form of the building is so fluid and round it was very difficult to capture the dramatic curvature of the centre. London Legacy Development . (2012). Introduction . Sustainability Guide . 1 (1), pg8 .